PONTE VEDRA BEACH, FL– It was perceived as a particularly bold concept for such a tradition-steeped sport, and not necessarily one that was universally embraced when it was first introduced. But by the time the PGA TOUR’s season-long FedExCup competition had finished its inaugural run, and Tiger Woods had emerged as champion following a compelling run through the TOUR’s first-ever Playoffs, it was widely deemed a significant success. And now, we get to relive all of the points permutations? The introduction of the FedExCup with a restructured schedule, and the ensuing drama that unfolded throughout the season, is documented in PGA TOUR 2007: A New Era in Golf, an NBC Sports special that airs on Sunday, December 30, at 3 p.m. ET. "The tournaments on our Tours have vividly demonstrated that giving back is the heart of the PGA TOUR"
Tim Finchem announced $123 million in in contributions, up from $114 mill. Maybe we could spend a little on getting him a better press release quote maker-upper? Then again, he is giving nearly all of the credit to the people who do the hard work, which is admirable. “Once again this year, the tournaments on our Tours have vividly demonstrated that giving back is the heart of the PGA TOUR,” Finchem said. “This tremendous accomplishment underscores the vital roles that our tournaments play in their communities. Our players, sponsors, tournament organizations, and volunteers and fans can all take pride in their role in ensuring that ours is a sport that leaves each of our communities better off for the presence of one of our events. Among other significant developments was the new record established by The Presidents Cup, which reached a high mark of $4.2 million in donations from the biennial event. On the Nationwide Tour, both the Albertsons Boise Open presented by First Health and the BMW Charity Pro-Am generated more than $2 million. Numerous Champions Tour events exceeded previous high levels of charitable giving, led by contributions of approximately $1.3 million from both the Toshiba Classic and the 3M Championship. In total, both the Champions Tour and Nationwide Tour achieved charitable giving records. STEVE STRICKER: Yeah, thanks. It is an honor, and to win this for the second straight year, I don't know how I did it, but it is an honor to be voted by your peers. Like Joe and I were talking about, we don't know if the award has the correct name or not. I mean, I won this last year, and I don't know what I did to deserve it again this year. But it is, it's a nice award, and I am honored. Q. Do you think you can win this a third year in a row? STEVE STRICKER: I don't know, I was thinking about what I would have to do to win this three years in a row, and usually you have to have a better year than last year. I don't know if I'd be out of this ballot and maybe be on the Player of the Year ballot, which would be nice. Doug Ferguson puts a new twist on the year-in-review story, taking us through 18 key holes. I almost feel sorry for the folks running the Skins. Almost. But this is clearly punishment for exempting the Players Championship The PLAYERS winner two years ago. I believe the coverage was pre-empted by fire coverage here in Southern California, but I'm not entirely sure because I forgot to turn it on. However, Freddie picked up some nice tip money. Q. You've been to a couple tournaments outside of the U.S. this year already, this is your third event outside the U.S., and now the season is over on the U.S. Tour. Would you like to come out more, especially after this experience in China, maybe this part of the world? Would you like to come out this way and play more events this year or maybe in the future? BOO WEEKLEY: Yes, I like to travel. It's just a long ways from home. But you know, I'd like to come over and play different golf courses. I'd like to see a little more of what the actual culture of how they built the courses -- I know they all ain't like this out here. It would be interesting to go see something more of a links style or something that they had them over here. Q. What about outside the golf course, would you like to see more? BOO WEEKLEY: Oh, yeah. I'd like to go see where like The Great Wall, just look and see what all this place has to offer. You know, just kind of like you live in the south where we live at, you know, it's a bunch of rednecks. And then you go north, you got the Yankees. So it's different. I know it's different over here, too. The excitement appears fully contained for the 25th Skins. I'd list the TV times, but do you really care? "The players are open to something that's new and exciting and fun." In Golf World's year-end "newsmakers" issue, I pitch an alternate scenario the PGA Tour should consider for the conclusion to the FedEx Cup. Granted, I'm simply advocating that they adopt an ADT Championship-like format for the finale. Based on some of the post ADT comments here and here, I think some of you would agree. But, I'd still love to hear what you all think even though we've probably covered the FedEx Cup enough! Oh and on the ADT front, Craig Dolch reports that no major changes are in order. And why should they be? Fresh Off Comeback Player Award, Stricker On Ballot Again!? I guess if you can reclaim your amateur status twice, why not have a comeback award worthy year after a comeback award worthy year? Doug Ferguson says Stricker is on the player ballot again. "But while equipment advances are nominal at the pro level, there are still gains to be had by the rest of us choppers." E. Michael Johnson belts out another howler of a Golf World equipment column with his jubilation at the news of driving distance going down. It's fascinating how his normally even-keeled weekly roundout of what guys have in the bag becomes so emotional on the subject of distance. Whew! That's a relief. Especially since the number is jigged around with more than...oh I better not say. Though the scoring average of 70.83 marks the first time it has dipped below 71, over the last five years the average on the PGA Tour has been 71.03, and over the past 10 years 71.10. From 1988 to 1997 it was 71.17. So the last 10 years have seen an improvement of a quarter-stroke per four rounds over the previous 10. Hardly cause for concern. Because after all it's such an unadjusted number! I know, I know. Courses are longer, pins are in insane positions, etc., etc. So? Pro golf is not a game. It is a sport. As such, it should be difficult, and the achievements of those playing it for a living are far superior to those of us who don't. The only courses that need to be lengthened are the 55 used for PGA Tour events. Any other venue doing so is just wasting open space. Oh that'll really happen. Can those PGA Tour courses bill the manufacturers for the expense incurred? But while equipment advances are nominal at the pro level, there are still gains to be had by the rest of us choppers. How much? Find a launch monitor that not only spits out launch conditions, but also reveals the optimum given your current swing speed. Odds are there's more than 20 yards you're not getting. Isn't that the only statistic you should be interested in? "People don't turn on the TV to watch Stephen Ames." Golf World's John Hawkins kicks off what figures to be an onslaught of Skins Game R.I.P. columns by covering a few key points while leaving out another. That said, get a load of this year's menu: Couples, the Sultan of Silly Season, will serve as the headliner despite not playing a competitive round since the Masters. He'll be joined by Zach Johnson, who won that green jacket but remains instantly unrecognizable in almost every airport he enters; Ames, who is back because he claimed nine skins last year; and Brett Wetterich, who got in because none of the nine guys ahead of him on the 2006 money list had any interest in participating. After all, it is the first official weekend of the holiday shopping season. In 2004 the winner of the Players Championship began receiving an automatic berth in the Skins Game, a compromise of the product that defeats the event's purpose. "The spirit of this thing has been lost in these qualifications," says a knowledgeable observer. "Originally, the idea was to have four guys yuk it up, have some fun and, by the way, there's a million dollars on the table." So without Woods, Mickelson and perhaps a half-dozen others, the off-season's grandest stage has become an ATM for the undeserving. People don't turn on the TV to watch Stephen Ames. In fact, the only decent ratings in the last 10 years were achieved in 2001, when Greg Norman and Colin Montgomerie teamed up with Tiger and Jesper Parnveik. Jesper Parnevik played the Skins Game? Wow...how quickly I completely forget. Perhaps Woods saw this thing moving in the wrong direction when he agreed to play in those Battle of Bighorn matches back in 1999. His commitment to a one-on-one, 18-hole duel on the last Monday night in August gave him a reason to skip the Skins but still flex his prime-time muscle. David Duval and Sergio Garcia were Tiger's first two foes, but when the format was expanded to four players and the concept failed to produce any final-hole heroics, made-for-TV golf had taken another step backward. Not said in the piece is event organizer's ability to pick the most drab (but high paying) golf courses possible, and their absolute refusal to increase the purse to dollar figures that would actually mean something in today's game. Steve Elling expands on the Fall Finish field issue and makes a compelling case for the winners of these events to earn Masters exemptions as well as other perks that go along with winning. According to the numbers crunched this week by statistical guru Jeff Sagarin, who does rankings for Golfweek magazine, all seven Fall Series events had better fields than the Wyndham Championship in Greensboro, N.C., and the John Deere Classic, both regular-season tournaments. It's interesting to note that, in a move that was widely applauded, Masters chairman Billy Payne last spring reinstated the rule in which all PGA Tour winners will be offered automatic exemptions to Augusta National. That is, everybody but the seven Fall Series winners and those who won events staged opposite the three remaining majors or World Golf Championship tournaments. Sounds like the Augusta brass should revisit their plan, especially since two of the seven Fall Series winners, Stephen Ames and Mike Weir, had already qualified for the Masters via other means. Thus, had the fall winners been included in Payne's plan, it would have meant adding a maximum of five more players to Augusta National's limited invitational field in 2008. Moreover, the Fall Series had a list of winners that was more familiar to fans than many of the names who won in the regular season. 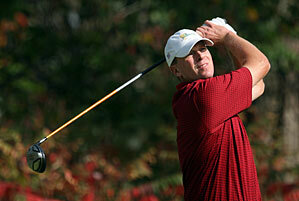 Included were Justin Leonard, Chad Campbell and Steve Flesch, who all have multiple tour victories. The seven winners have combined for 29 career victories, two majors and two Players Championship wins. Hardly a bunch of complete stiffs, in other words. Four tournaments during the Fall Series had a stronger field than the Wyndham Championship in Greensboro, which counts as a FedEx Cup event and whose winner (Brandt Snedeker) got an automatic invitation to the Masters. The final PGA Tour money list where the top 125 are fully exempt next year and the top 30 gets you in the Masters. And the final Nationwide Tour money list reveals some familiar and new names in the top 25 earning a PGA Tour card. Boo Weekley and Heath Slocum sat down with the scribblers to talk about playing in the World Cup. STEWART MOORE: Heath and Boo, thank you for spending a few minutes with us in the Children's Miracle Network Classic interview room. You guys are going to be representing the United States in the World Cup November 19th in China. I'm sure the world is awaiting Boo Weekley's arrival in China. Maybe talk about what you guys are going to look forward to and then we'll take some questions. BOO WEEKLEY: I think it will just be fun just to go over there. I know I've only left the country one time, and that was to go to Scotland, and it will be fun to see what's going on. Q. You played in Mexico, didn't you? HEATH SLOCUM: That's still North America. BOO WEEKLEY: Twice then. Yeah, that's still part of North America. Thanks, Heath. Q. What do you know about China? BOO WEEKLEY: It's a long ways away. They got the Great Wall of China. BOO WEEKLEY: I'm excited to go over there, and like Heath said, it's an honor to represent your country. I wouldn't have gone by myself, though; it's not that I didn't want to represent my country, but I ain't into traveling, especially during hunting season. Q. What season is it? Q. It would be deer season if you were at home now? BOO WEEKLEY: I would have gotten up at 4:30 in the morning, and I'd probably still be in the woods right now. Preparing for a future as a player architect, no doubt. Q. How do you get from home to China? Q. You can answer it. BOO WEEKLEY: I think we go to Charlotte or Atlanta, and then somewhere else, and then over. Q. How long does it take? Did you look? HEATH SLOCUM: Atlanta to Seoul to Hong Kong, eighteen hours flying time. Glad it's them and not me! Charity was at the heart of the PGA Tour's decision to invite Boo Weekley to represent America in the World Cup, November 19-25. Can't wait for those interview transcripts where Boo opines on the food, culture and other worldly insights. "It's like a glorified club championship." Dubbed the Fall Series, the final seven events on the PGA Tour schedule will mercifully come to an end next week in Orlando, where the biggest stories will revolve around players losing their full-time status (despite making $700,000 this year) or secure veterans who try to fit in golf around visits to the Disney theme parks. "There were 100 people following the final group last Sunday in Scottsdale," said PGA Tour veteran Steve Flesch. "It's like a glorified club championship. I don't think that's what the tour intended. And I think they need to address it." "It's a slap in the face to some of those events to almost label them B-class events," said Daniel Chopra, who was in contention for his first PGA Tour victory at the weather-plagued Ginn. "Disney's been around for years. Vegas has great history at that event. ... We need to do something because these sponsors are putting up a lot of money, and the tournaments are not getting the respect they deserve." Harig also explores possible solutions, including one that I remember hearing in the early FedEx Cup chatter: points in the fall counting for the following season. I've always wondered why that notion died. Seemed like a win-win for the Tour, FedEx and the fall event sponsors. Oh, and those guys the Tour revolves around, the players.